Accommodation in Kingsbury Episcopi, Somerset. Our 7 day weather forecast for Kingsbury Episcopi updated throughout the day, making it ideal for planning leisure activities, travel and events. Read more about our weather forecasts. On Sunday 21st April 2019 the sun will rise at 06:04 and will set at 20:16. It will be a mild day, with temperatures reaching around 21.4°C. Today is expected to be a dry day, with a very low chance of rain. It will be a very clam day today, with a maximum expected wind speed of 7mph. On Monday 22nd April 2019 the sun will rise at 06:02 and will set at 20:17. It will be a mild day, with temperatures reaching around 20.2°C. Today is expected to be a dry day, with a very low chance of rain. It will be quite a breezy day, with a maximum expected wind speed of 16mph. On Tuesday 23rd April 2019 the sun will rise at 06:00 and will set at 20:19. It will be a mild day, with temperatures reaching around 19.9°C. A few showers are expected, 3mm of rainfall is possible today. It will be quite a breezy day, with a maximum expected wind speed of 19mph. On Wednesday 24th April 2019 the sun will rise at 05:58 and will set at 20:21. It will be a mild day, with temperatures reaching around 13.7°C. A few showers are expected, 4mm of rainfall is possible today. It will be quite a breezy day, with a maximum expected wind speed of 21mph. On Thursday 25th April 2019 the sun will rise at 05:56 and will set at 20:22. It will be a mild day, with temperatures reaching around 12.3°C. A light shower is possible, 2mm of rainfall is possible today. It could be quite a gusty day today, with a maximum expected wind speed of 32mph. On Friday 26th April 2019 the sun will rise at 05:54 and will set at 20:24. It will be a mild day, with temperatures reaching around 12.2°C. Some moderate to heavy rain is expected, 6mm of rainfall is possible today. Some quite strong winds are possible today, with a maximum expected wind speed of 40mph. On Saturday 27th April 2019 the sun will rise at 05:52 and will set at 20:26. It will be a mild day, with temperatures reaching around 7.4°C. Some moderate to heavy rain is expected, 6mm of rainfall is possible today. It will be quite a breezy day, with a maximum expected wind speed of 17mph. Our weather forecast for Kingsbury Episcopi is updated throughout the day and has been found to be very reliable for planning activities such as days out, leisure, travel, events, fishing, golf and gardening. 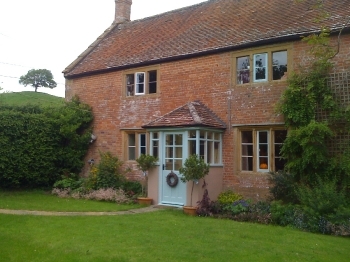 Burrow Hill Bed and Breakfast offers first class, homely accommodation in an 18th Century cottage in Kingsbury Episcopi, a small village on the Somerset Levels in the heart of cider making country. Close to many places on interest you can be assured of a pleasurable stay. Our double rooms overlook either the front garden or Burrow Hill and have far reaching views over the surrounding area as far as Ham Hill in the distance. Each has its own bathroom complete with walk-in power shower and endless hot water. Complimentary mineral water and tea and coffee making facilities, TV and hair dryer are also included for your use. The rooms are non-smoking. Just a few miles drive from the A303, this spot has the advantage of easy access for travel whilst at the same time offering a complete break from the hustle and bustle of life. Burrow Hill Bed and Breakfast is 20 miles from Taunton, 65 miles from Bournemouth, 50 miles from Bath, 55 miles from Bristol and 85 miles from Plymouth. We are conveniently situated to many National Trust properties and NGS gardens. This is the place to be if you REALLY want to enjoy peace and tranquillity! No street lights, hardly any traffic but lots of fresh air, amazing views and night skies to die for! As we are in the heart of the countryside, you will need a car to enable you to get around. The added bonus? We are right next door to the Somerset Cider Brandy Company where you will find probably the best cider in Somerset!